Olga Moisuc has a keen interest in working with children, adolescents and families. Having obtained extensive experience working with children and teens across settings including hospitals, research institutes, kindergartens, schools and community settings, her philosophy is that every single child and adolescent has remarkable potential and unique qualities that they bring to the world. 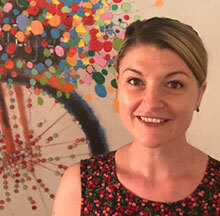 Olga is an Educational and Developmental Psychologist and obtained her Masters in Educational and Developmental Psychology at Melbourne University in Victoria. She is proficient in conducting a range of assessments for cognitive, educational, mental health and developmental purposes. Olga specialises in utilising a range of therapeutic techniques such as Cognitive Behaviour Therapy (CBT), Acceptance and Commitment Therapy (ACT), Solution focused therapy, Play therapy, Rational Emotive Behavioural Therapy (REBT), Motivational Interviewing, Behaviour Modification and Emotional Coaching. In saying this, Olga acknowledges each child and family is different and will use strategies that are best suited to your particular child and family.